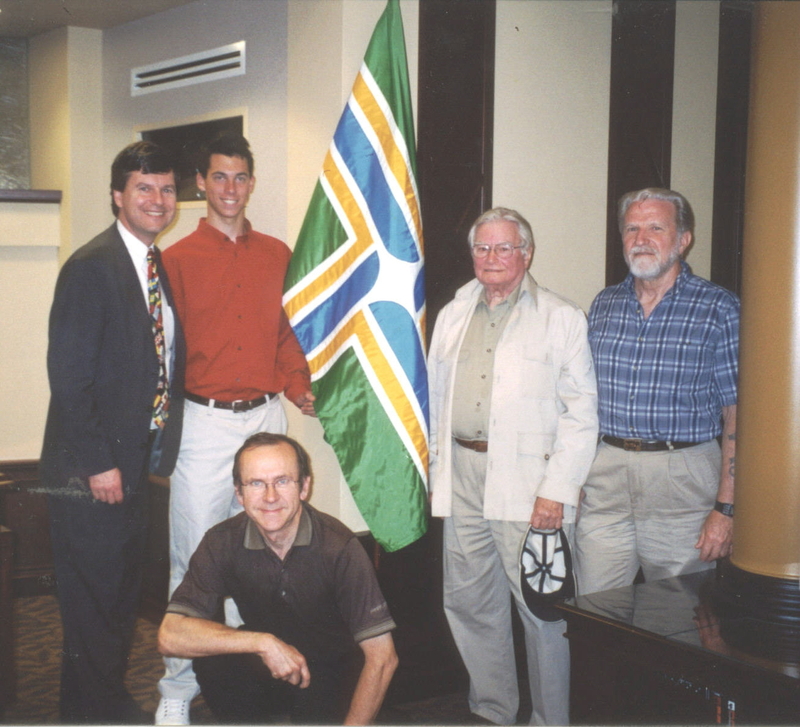 Ted & Mason Kaye, Fred Paltridge, Douglas Lynch, and John Hood with the newly-adopted Portland city flag at city hall, 2002. 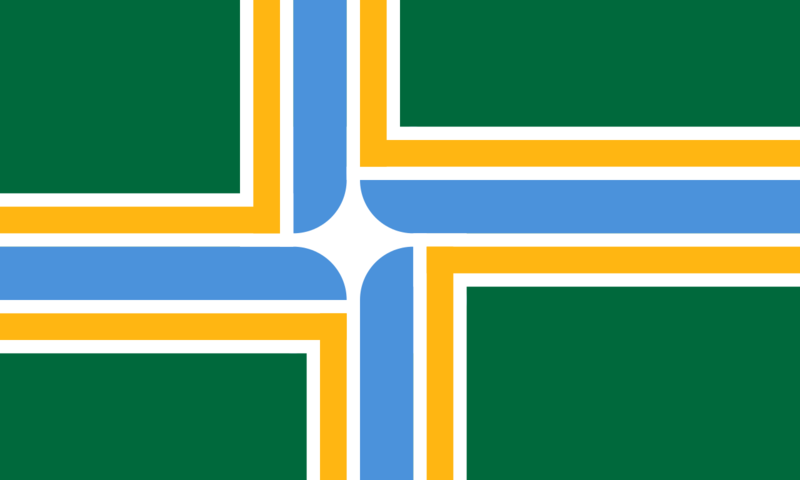 A stick flag showing the previous design of Portland’s flag, in (very limited) use 1970-2002. Lynch never liked this modification of his original design. Over the course of its short 13 year existence, the revitalized flag has gone from a seldom-seen accoutrement of city government to a widely embraced symbol of the city, people, and culture of Portland. Its enthusiastic adoption by the Timbers Army, a zealous group of fans supporting the city’s Major League Soccer team, was important in establishing the flag’s visibility and fashionability, as has the more recent decision by Portland Fire & Rescue to fly the flag along with the US flag from every fire station’s flagpole. 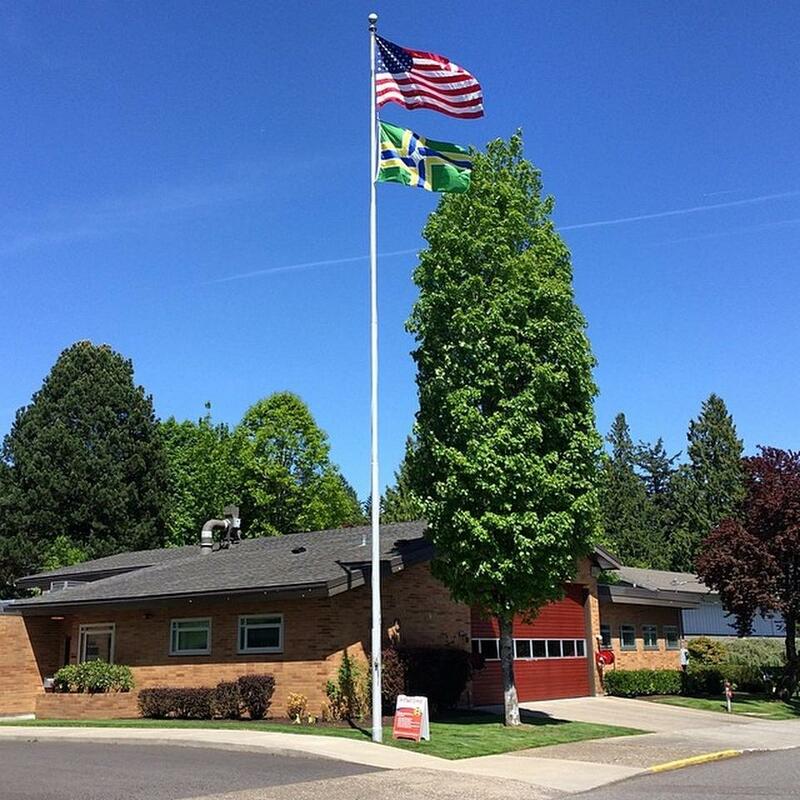 The US and Portland flags fly above Portland Fire & Rescue Station 5. Photo by Scott Mainwaring. Though crosses are commonly found on flags, Lynch’s design is unique. It does however have some resemblance to other crossed flags. 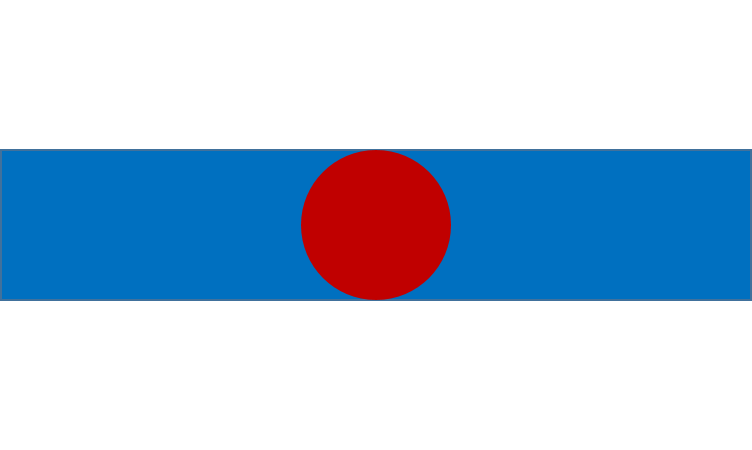 As it is offset towards the left (hoist) side of the flag, it resembles a Nordic Cross, as found on the flags of Denmark, Iceland, etc. And as the arms come together to suggest counter-clockwise rotation, it resembles an ancient Celtic motif known as Brigid’s cross. 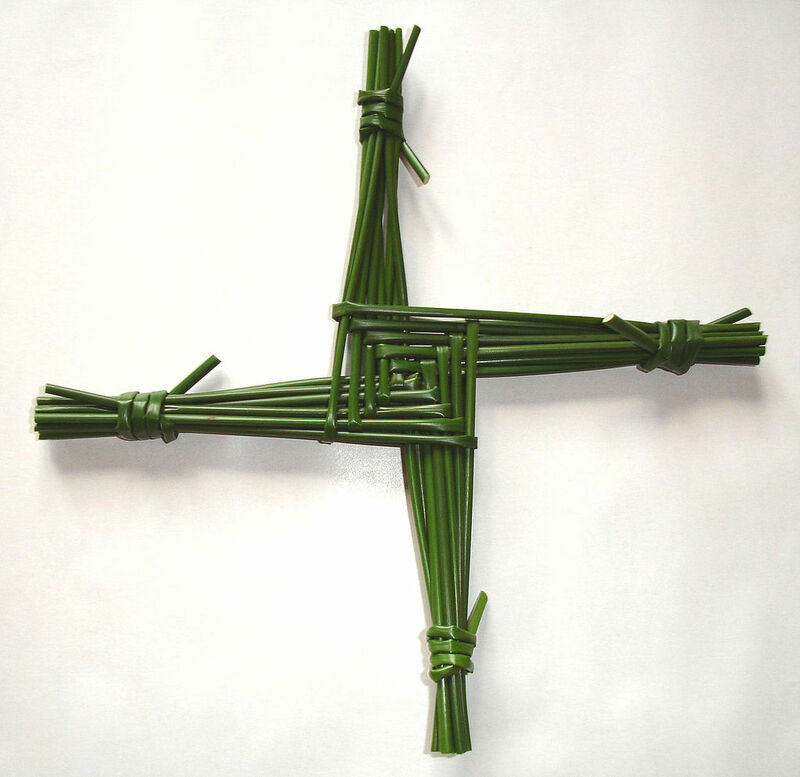 Brigid’s cross, a pre-Christian symbol associated with the Celtic goddess Brigid. The background shall be green, symbolizing the forests and our green City. The design includes a four-pointed directional star, formed by the vertical and horizontal intersection of counterchanged light blue stripes, symbolizing our rivers. The blue stripes are paralleled with yellow stripes, symbolizing agriculture and commerce. The yellow stripes are separated from the green background and the blue river stripes by white lines called fimbriations. The flag of Portland, Oregon. Designed by Douglas Lynch. The Portland flag is inspirational in its strong design. 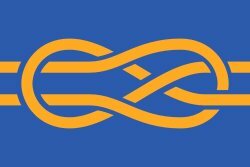 In a recent example, our friends at Vexillology Ireland have launched a campaign, citing the Portland flag as inspiration, to encourage the use of Brigid’s cross on flags. They have a short video providing an excellent overview on the use of crosses on all sorts of flags. Every June, Portland’s Rose Festival welcomes “the fleet” from the US and Canada. 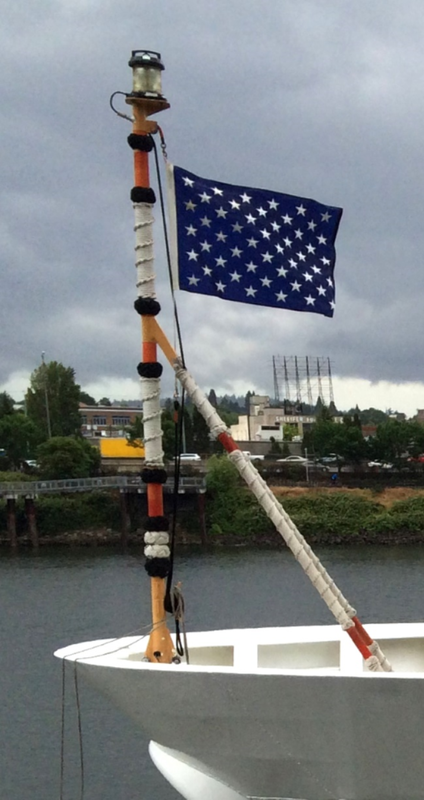 Moored along the Willamette river, the ships display a colorful range of flags to see—ensigns, jacks, signal flags, and courtesy flags. 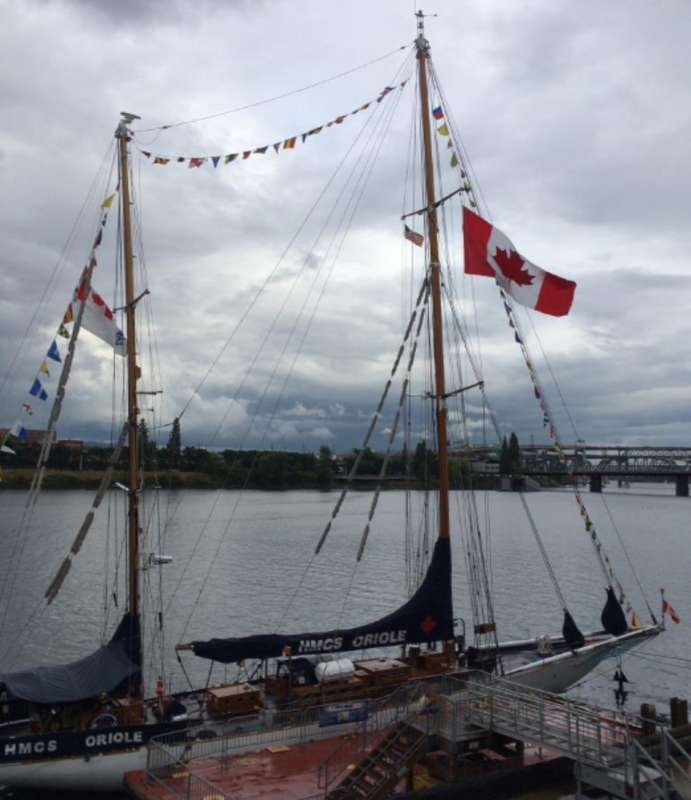 A large Maple Leaf Flag, along with many smaller flags, flies from the sailing ketch HMCS Oriole, a Canadian Navy sail training vessel (launched in 1921, she is the oldest commissioned ship in the Royal Canadian Navy). 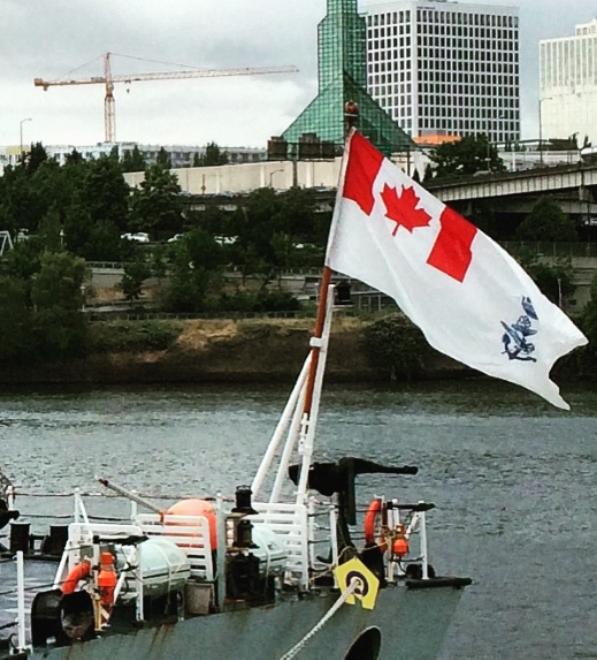 The maritime signal flag “K”, the POW-MIA flag, and the Portland city flag fly on the USCGC Waesche. The Canadian Naval Ensign flies from the frigate HMCS Calgary (FFH 335). The Union Jack of the United States flies from the bow of USCGC Waesche (WMSL-751), a National Security Cutter. She flies the traditional U.S. jack—only US Navy ships are flying the so-called First Navy Jack with the rattlesnake. About eight years ago a group of friends who attended Willamette University in the late 90s formed our band, Original Middleage Ska Enjoy Club. Our bandmate, Don Olsen, teaches art at local colleges—so we always have fun posters and materials. Our band is influenced by ska music, which originated in Jamaica in the early 1960s. In subsequent years, ska turned into rocksteady, which turned into reggae, and by the late 1960s reggae had become a world-wide phenomenon. The most famous ska band (and our favorite) is The Skatalites, studio musicians in Jamaica playing behind singers such as Bob Marley in his early years. As cultural ambassadors, The Skatalites used the Jamaican flag to communicate their identity in their materials. The Jamaican flag, adopted 1962. On a trip to Chicago several years ago, Don noticed several people with a tattoo of the Chicago city flag. 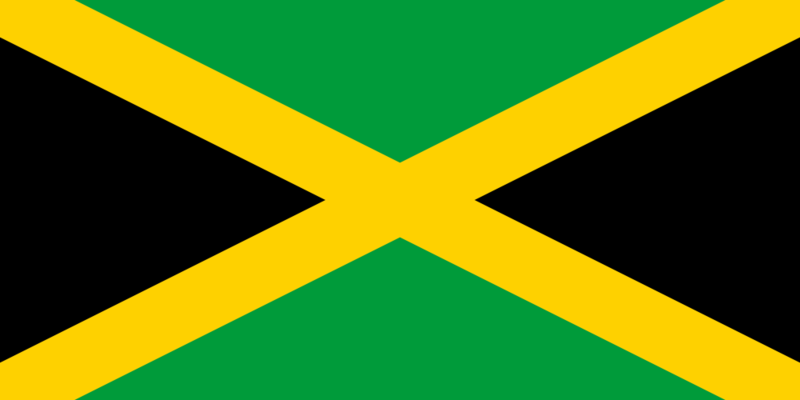 Don took a closer look at the Portland flag when he returned, and realized that if he turned the Portland flag on an angle, it reminded him of the Jamaican flag. Ska, Rocksteady, and Reggae originated in Jamaica in the 1960s and spread throughout the world, including the Northwest. In this tradition we have combined the flags of Portland and Jamaica into one, to represent the place we live and the music we love. Do you like to dance to the offbeat too? 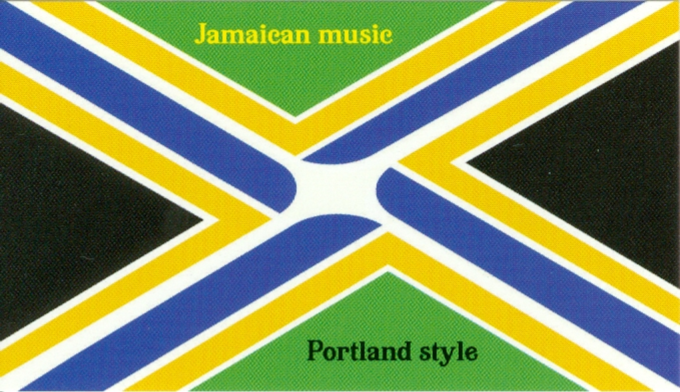 Fly this flag to celebrate Jamaican music, Portland style. Respect. 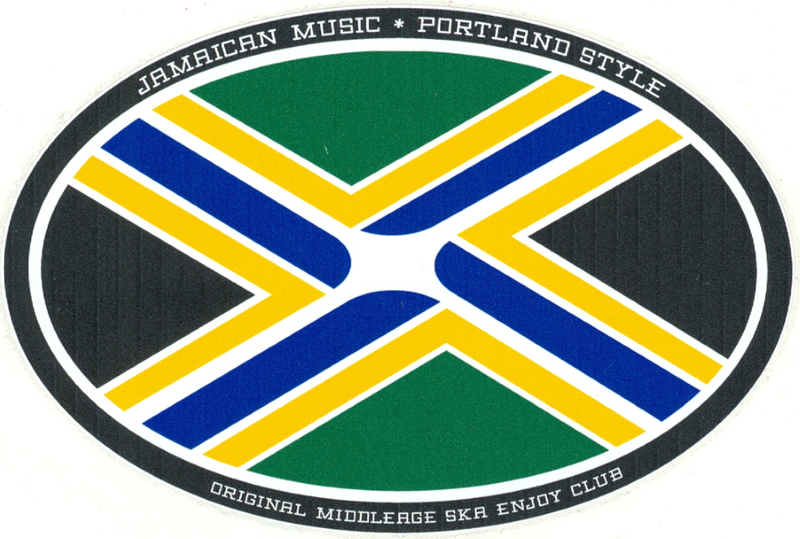 Don Olsen’s design for an OMSEC flag combines those of Jamaica and Portland. We made a 3’ x 5’ version which we hang behind us during concerts, and we made the postcards to send out to our friends. Our goal is for people who love living in Portland and listening to Jamaican music, as we do, to fly the flag in celebration. 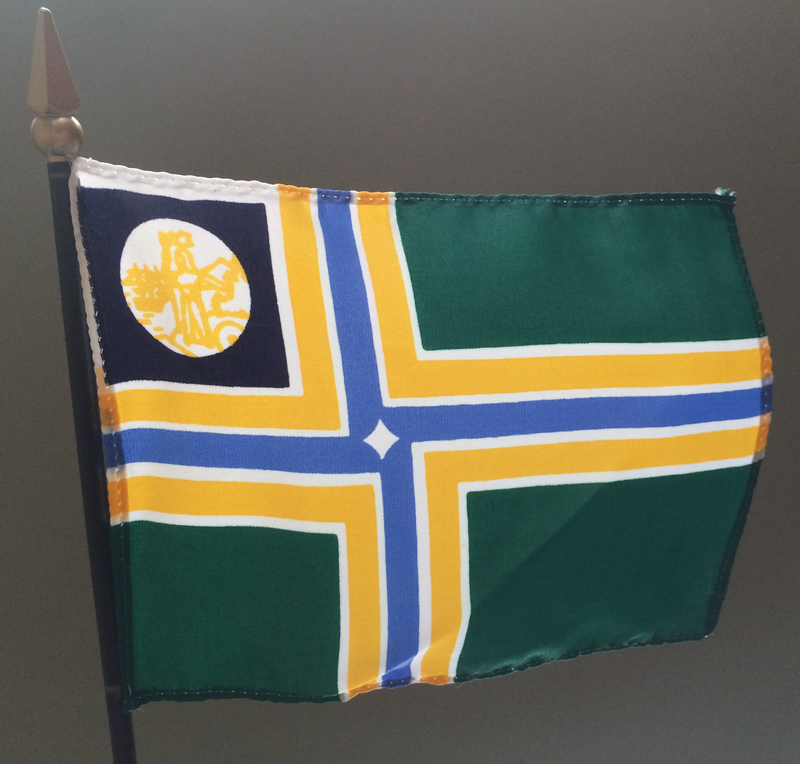 It’s been a lot of fun to share with everyone, and we have gotten quite a positive response from many people, especially as more and more people become familiar with the Portland flag. 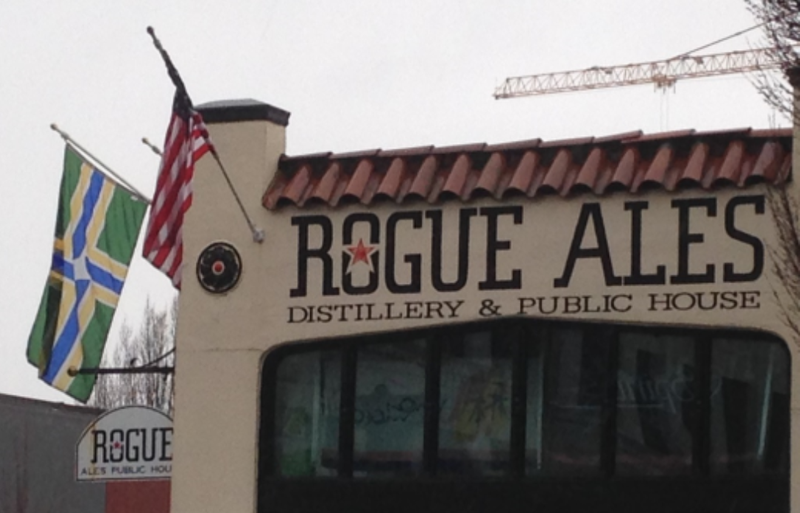 Flag of Portland’s Original Middleage Ska Enjoy Club. One fun tidbit—a couple of years ago I invited Mayor Sam Adams to our show by sending him a version of the flag, and he liked it so much he tweeted it to 50,000 people! Over the past few years I have been compiling a list of places in Portland that fly the city’s flag. When it started in 2011 the flag could be seen only in a handful of places: city hall, the Portland Building, Pioneer Courthouse Square, the Oregon Convention Center, Jefferson Office Park, and the Portland Timbers’ stadium (only on game days). It’s grown to 23 entries, greatly helped by a decision by the city government to fly the flag at every Portland Fire and Rescue station across the city. US and Portland flags flying at Portland Fire and Rescue Station No. 5 in the Hillsdale neighborhood. Photo by Scott Mainwaring. 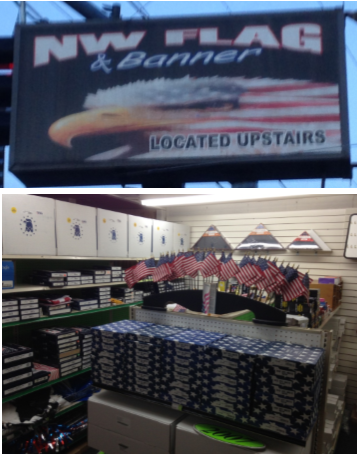 What’s keeping more hotels, restaurants, and other places that have invested in flag poles from flying the flag? Perhaps there’s a misunderstanding that the flag represents only the city government, rather than the city and its people as a whole. It may have started out as the former, but now is certainly the latter, in no small measure due to the fans of the Portland Timbers’ enthusiastic adoption of the flag. 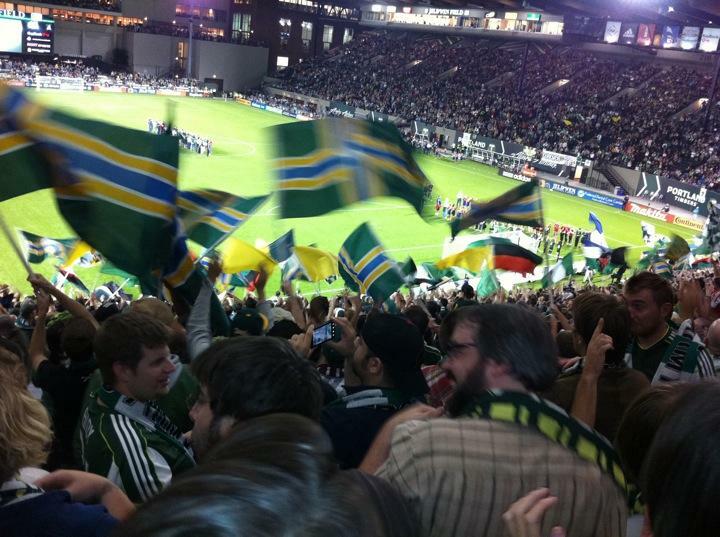 Portland flags waving at a Timbers game in 2011. Photo by Kristin Wolff, via Foursquare. 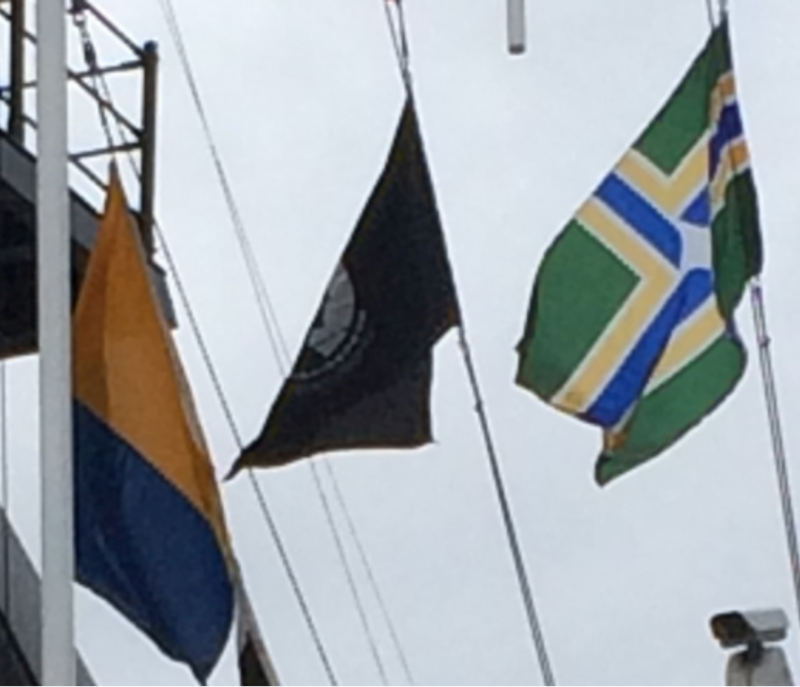 There may also be a misunderstanding that in order to fly the Portland flag, it must be accompanied by the US and Oregon flags. Flag etiquette does require these “outranking” flags to be given more respect than the city flag, e.g., by literally flying them above it on a shared pole. But there is no rule of etiquette saying the Portland flag can’t be flown by itself, or only with the US flag (as is the case at most of the Portland Fire and Rescue stations), or only with the Oregon flag for that matter. 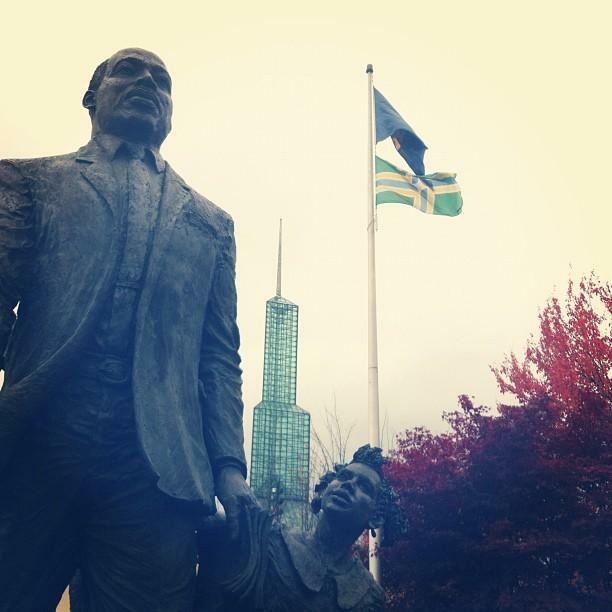 The statue of Martin Luther King Jr. at the Oregon Convention Center. Nearby the Portland flag flies beneath the Oregon flag. Photo by Scott Mainwaring. The biggest factor limiting the public display of the Portland flag is probably not misunderstanding, but simply understanding that Portland has a flag. Every time the Portland flag is raised in a new locale, used in merchandising or advertising, or spreads through word of mouth, public recognition grows. This “virtuous cycle” is underway. Winning design from a 1917 contest for a city flag for Portland, Oregon. Designed by H. W. Frederick. Although winning the competition, the design was deemed unworthy and never adopted. 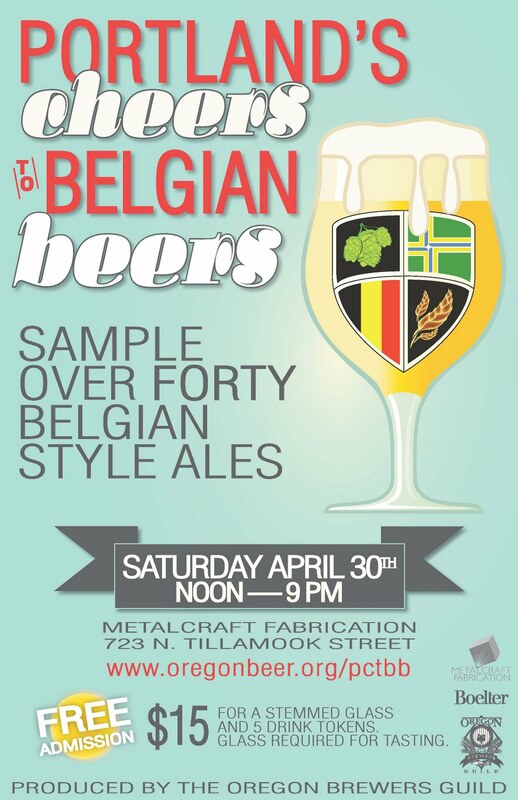 Portland’s Rock Bottom Brewery hosted the Portland Belgian Beer Challenge on April 10, 2012. It featured a taste-off between beers from Amnesia, Rock Bottom, Roots, Lucky Lab, BJ’s, Concordia, Hair of the Dog, McMennamin’s Crystal Ballroom, and New Old Lompoc—ten breweries in all. 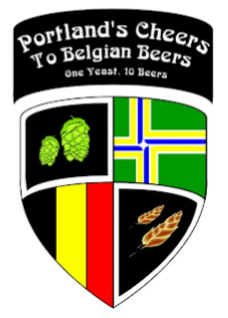 Logo of the Portland Belgian Beer Challenge, Rock Bottom Brewery, April 10, 2012. 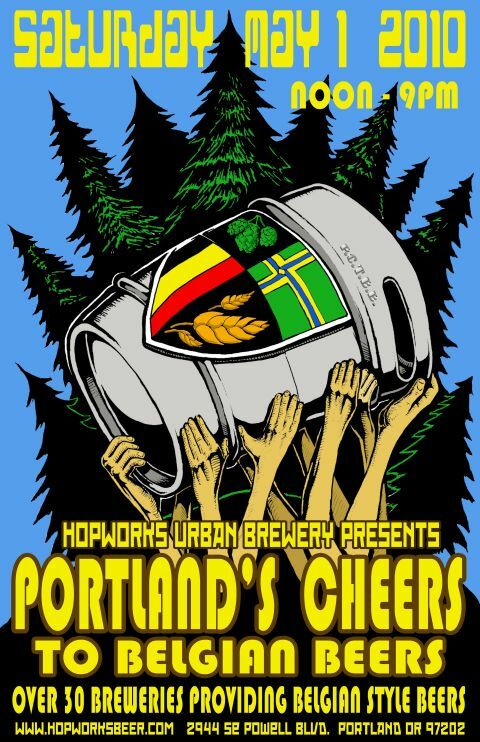 With 46 microbrewers of craft beer, Portland has more breweries per capita than any other city in the world and more than a third of the state’s total. 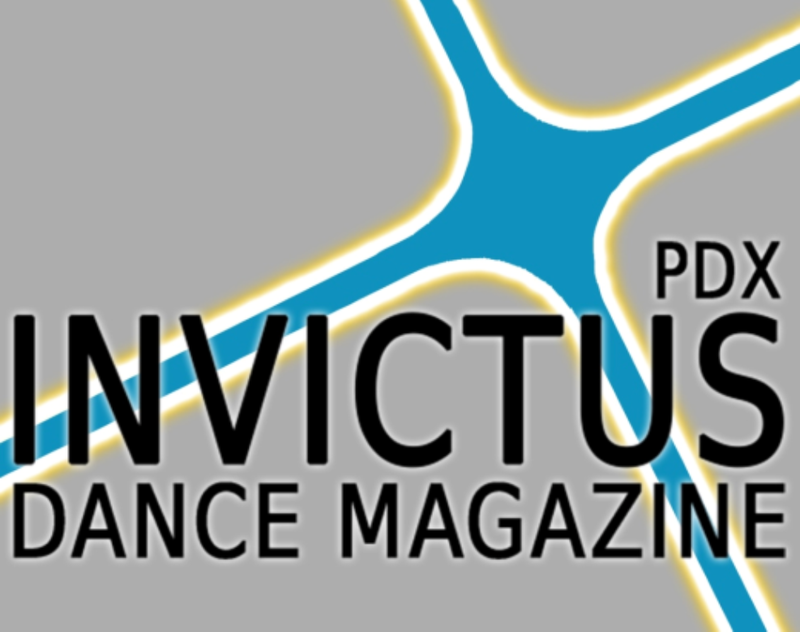 Many have won nationwide and international acclaim. The craft beer industry in Oregon dates from a 1985 reform law allowing small-scale brewing in brewpubs. The Portland flag flying on the Elizabeth. Photograph by Charlie Hales. How did Portland get such a nice flag? Our very own Ted Kaye sat down with popular design podcaster Roman Mars to talk flag design and tell the story of the Portland flag: how a good design was botched by bureaucrats, and many years later — with some activist vexillology on the part of its designer Douglas Lynch and the PFA — ultimately restored. 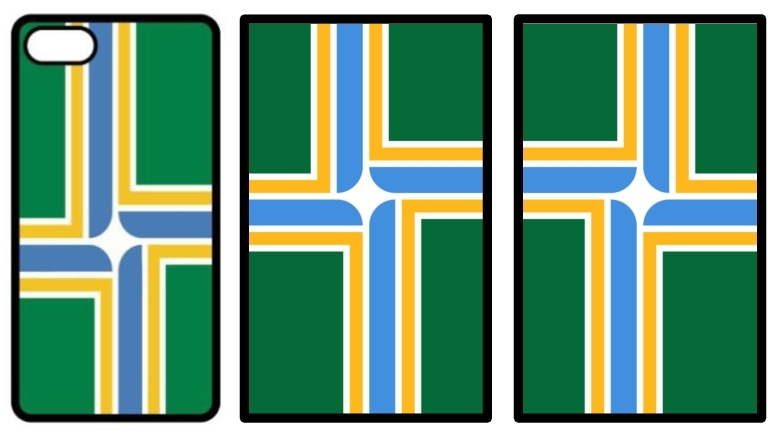 For this work, Lynch received the Vexillonnaire Award from the North American Vexillological Association (NAVA) in 2003 — and Portland received what has become one of the most loved municipal flags in the country. Check out Roman Mars’ podcast 99% Invisible, Episode 140: Vexillonaire (also cross-posted on Slate Magazine’s design blog The Eye as Portland’s Quest for a Better City Flag). 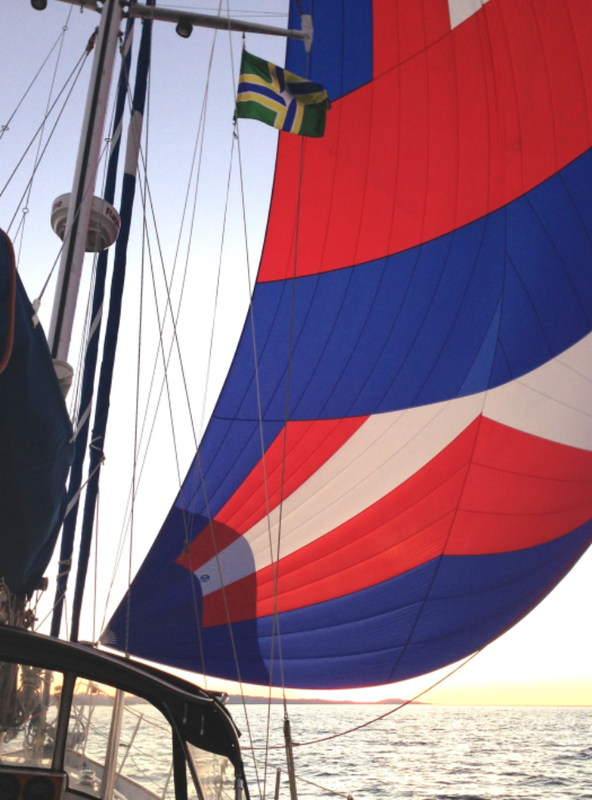 And to learn more about vexillonnaires, jump to the last page (p. 16) of NAVA News Issue 179. Author SDMPosted on November 12, 2014 October 14, 2015 Categories PostsTags City Flags, Flag Design, Flags Online, Portland FlagLeave a comment on How did Portland get such a nice flag?